Sirloin tip steak -- more widely known as flap meat -- is surprisingly flavorful and tender given its relatively low cost. 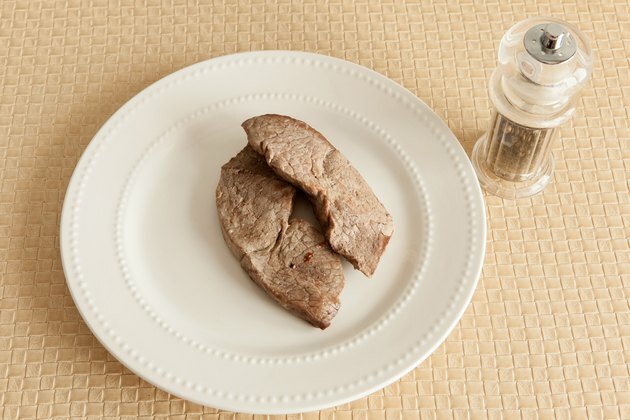 This cheap cut does well with fast cooking methods like pan searing and grilling, but with a little tenderizing marination, you can turn out a great baked sirloin tip steak, too. This healthy cooking method eliminates the need for added fat and calories from oil and butter. Tip steak's texture isn't ideal when the meat's still rare or even medium-rare, so it's definitely best to go with the USDA's recommendation to cook to medium, or 145 degrees Fahrenheit, in this instance. 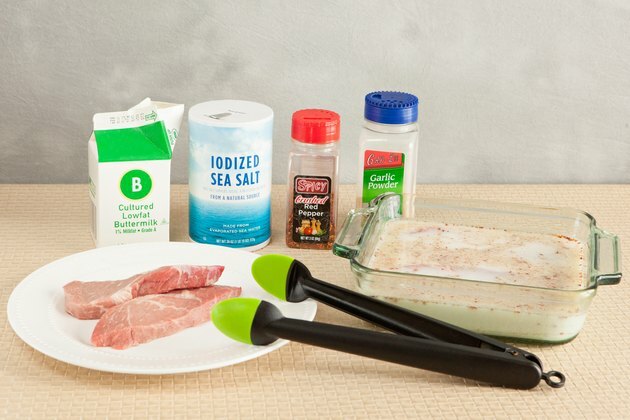 Soak the sirloin tip steak in a marinade made with milk, buttermilk, pineapple juice or papaya juice. These liquids contain enzymes that tenderize meat, rather than just flavor it. Use these ingredients alone, or add complementary seasonings. Because these are acidic liquids, use a non-reactive dish, like one made from glass, ceramic, stainless steel or plastic. Cover the dish with its lid or plastic wrap and refrigerate the steak for about an 30 minutes, flipping once after 15 minutes. Don't marinate longer, or the meat will become soggy from the acids. Preheat the oven to 325 F during the last 20 minutes of the marinating time. 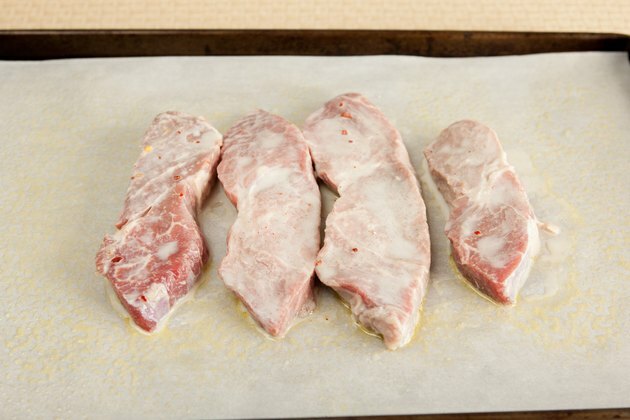 Place a sheet of parchment paper or aluminum foil over a baking tray, and lightly grease it with nonstick spray. Take the sirloin tip steak out of the marinade, and let the excess run off. Pour the liquid, which has been contaminated by raw beef, down the drain. 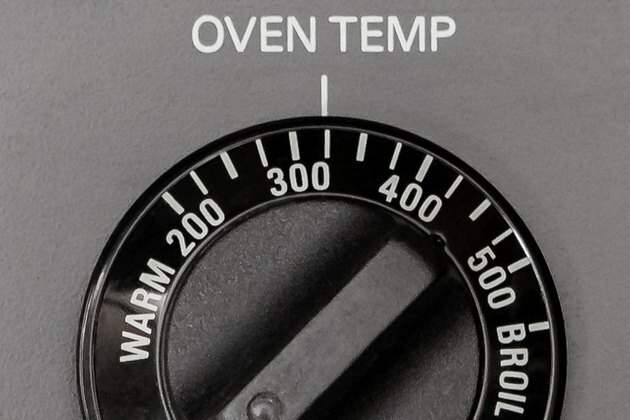 Lay the steak on the center of the lined baking tray, and put it into the middle of the oven. Bake a 1-inch-thick sirloin tip steak for approximately 13 minutes for medium doneness; bake a 1 1/2-inch-thick cut for about 16 minutes for medium doneness; and bake a 2-inch-thick cut for about 18 minutes for medium. 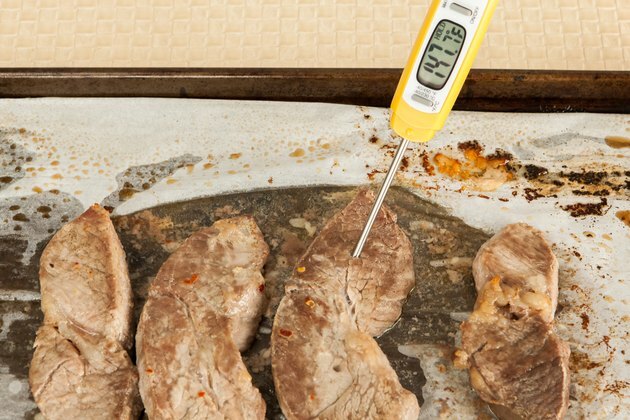 Cooking times are only estimates, though, so use an instant-read meat thermometer to determine when the steak has reached 145 F at center. Transfer the sirloin tip steak from the baking tray to a plate to rest. Let it sit for 5 to 10 minutes so its juices settle. Sprinkle on some salt and freshly cracked black pepper to taste. Store a sirloin tip steak below 40 F, and use or freeze it within 5 days of purchase at most. Don't leave beef out at room temperature longer than 2 hours.